Menu bar: Like just about every other program you launch, Elements supports drop-down lists. The menus are logically constructed and identified to provide commands for working with your pictures (including many commands that you don’t find supported in tools and on panels). A quick glimpse at the menu names gives you a hint of what might be contained in a given menu list. Most of the menu commands you find in Elements 14 are the same as those you found in earlier versions of Elements. 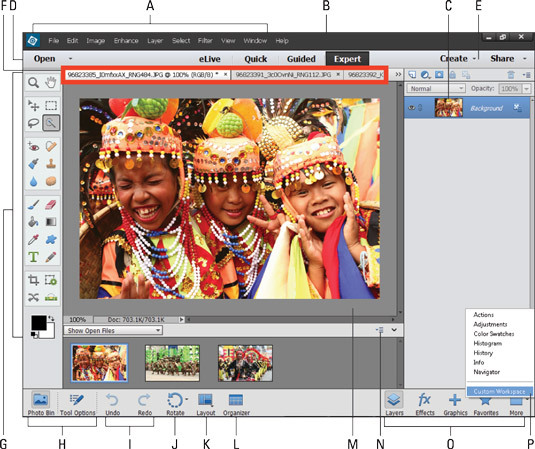 Photo Editor modes: The Photo Editor has three modes: Expert mode, Quick mode, and Guided mode. Panel Bin: You change panels by clicking the icons at the bottom of the Panel Bin. Creations (things you make) are also contained in the Panel Bin when you click the Create button. Open menu: When you have several files open in the Photo Editor, the Open menu is one way to switch among these files. To use this menu, click Open and from the drop-down list, choose the image you want to move to the foreground. The Open menu also offers you an option to create a new, blank file. Click a tab at the top of the image window to move the image to the foreground. Click a photo in the Photo Bin. Open the Window menu and choose a photo. Create and Share menus: When you open the Create menu and choose an option, you leave the current editing mode. For example, when in Expert mode, choose Create → Photo Collage, and all the options that were available in the Photo Editor temporarily disappear when the Creation Wizard opens. To return to the Photo Editor, complete the creation or cancel the wizard. The Share menu works similarly and offers options for sharing your images. Photo tabs: Multiple photos opened in the Photo Editor appear in different tabs at the top of the window by default. In technical-speak, this is a docked position, where the photos are docked in the image window. You can click a tab and drag it down to undock the photo. However, you must change a preference setting to undock the windows. Doing so makes the photo appear as a floating window. You might want to float windows when copying and pasting image data between two or more photos. You can also view all open files in a floating window without changing preferences by choosing All Floating from the Layout pop-up menu. Tools panel: Here you find the Photo Editor toolbox, where you click a tool and apply an edit to the photo. Photo Bin/Tool Options: Click the Tool Options button, and a set of Tool Options replaces the Photo Bin. You can also open the Tool Options by clicking a tool in the Tools panel. Tool Options enable you to specify how the selected tool works. For example, the Tool Options for the Brush tool enable you to select from a few different brush styles, set the size of your brush, and much more. Each tool in the Tools panel supports various tool options. To return to the Photo Bin, click the Photo Bin button at the bottom left of the window. Undo/Redo: These commands are so useful, they have this extra prominent place in the Photo Editor interface. Click the respective tool for Undo or Redo. You can also press Ctrl+Z (⌘+Z on the Mac) for Undo and Ctrl+Y (⌘+Y) for Redo. Rotate: Click the arrow to open a pop-up menu and choose the Clockwise or Counterclockwise tool to rotate the photo you see in the image window. Layout: When you have multiple photos open in the Photo Editor, the Layout pop-up menu enables you to choose how the photos display in the image window (such as rows, columns, as a grid, and so on). To return to the tabbed view, choose Default from the Layout pop-up menu. Organizer: Click the Organizer button to return to the Organizer. Elements makes it very easy for you to toggle back and forth between the Organizer and the Photo Editor by clicking the respective buttons at the bottom of the windows. Image window: In this window, you view a photo you want to edit. Likewise, you can view multiple photos you want to edit. Photo Bin Options menu: Click this icon to open a pop-up menu of tasks, such as making creations from photos selected in the Photo Bin and printing selected photos. Panel Bin icons: Click an icon at the bottom of the Panel Bin to display a different panel. Your choices are the Layers panel, the Effects panel, the Graphics panel, and the Favorites panel. These panels are docked in the Panel Bin by default and can’t be removed, unless you choose Custom Workspace. Panel Options menu: To open additional panels, click the right-pointing arrow to open a pop-up menu of choices. The panels you open from the Panel Options menu appear as floating windows and can’t be docked in the Panel Bin. Notice at the bottom of the pop-up menu you find Custom Workspace. When you click Custom Workspace, you can move panels around and dock or undock them in the Panel Bin. Tool Options provide more editing features for tools selected in the Tools panel.